As the horse-loving daughter of decidedly non-horse-loving parents, I know how hard it was for them to find just the right "horsey" gifts for me. They eventually quit buying equine-themed gifts for fear of duplicating what I already owned, especially when it came to model horses and figurines. What they didn't realize was that there is a whole world full of equine-themed gifts out there that I would have been thrilled with! Buying something out of the ordinary makes it far less likely that your friend or relative will already have the same item. One thing to look for is anything connected with an artist. This could be horsy designs on CafePress or Zazzle, original art or jewellery, hand-painted items such as shirts and totes, even one-of-a-kind Christmas ornaments. Many artists are selling their work on-line where you can have your favourite design printed on t-shirts, tote bags, hats, necklaces, Kindle cases, all kinds of things. A lot of artists offer gift certificates for paintings or photographic portraits of a person's own horse. Even if the recipient doesn't own a horse, he or she might have a favourite at a local riding stable or be a fan of a famous race horse, jumper, movie horse and so on. 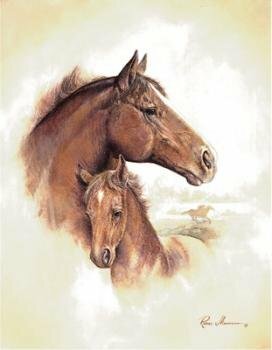 I am an artist myself, but one of my treasured possessions is a limited edition print of an old drawing by another artist of the great race horse Seabiscuit with his first ten foals. Artists and photographers also offer a lot of other gift items based on their work, such as prints, posters and collector plates. Two other pieces that I personally own and love are two collector plates by the late Fred Stone featuring Northern Dancer and Man O'War and a small one of the famous mare Fanfreluche with her Secretariat foal. 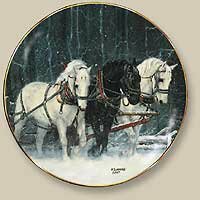 A friend had her dining room surrounded by a plate rail filled with amazing horse plates of all kinds. What a gorgeous display they made! 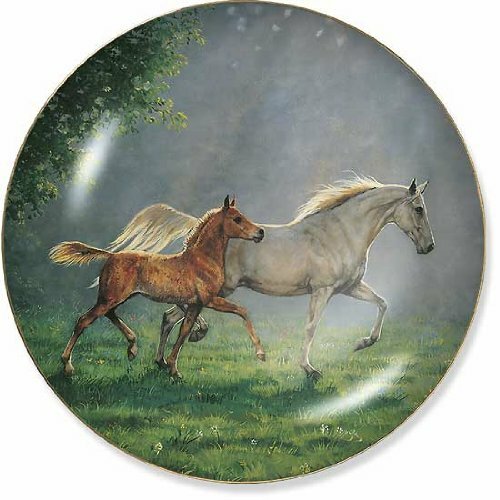 Some people like collector plates with almost any horse, while others prefer themes such as a certain breed or colour, famous horses or a particular sport like show jumping. The great thing about plates is that, if it's a duplicate, the recipient can often trade it with another collector for a similar one that they don't have. The secret is to buy good plates by well-known artists. The smaller ones are quite inexpensive. The cheap discount-store plates are generally by poor artists and have little real value, but would probably delight a young child. Posters, posters, who want posters? 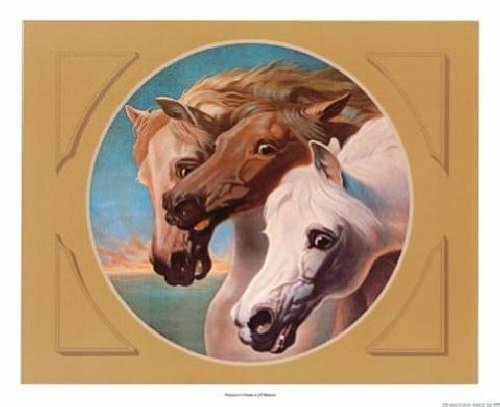 Horses are among the most popular subjects for commercial posters, and there are so many types to choose from! 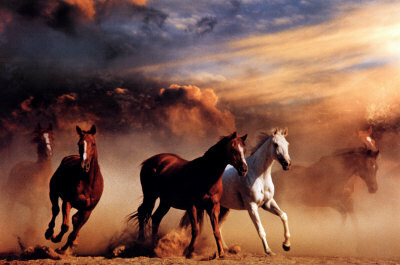 You can get posters of famous horses, cute horses, baby horses, pretty horses, and all breeds and colours imaginable. Some are reproductions of paintings from long ago, and capture all the delightful vibrancy of the original works, like this example of The Pharaoh's Horses by Herring. Some are by more recent arrtists such as Fred Stone and Chuck DeHaan. Others are photographs, and some of these are truly breathtaking. 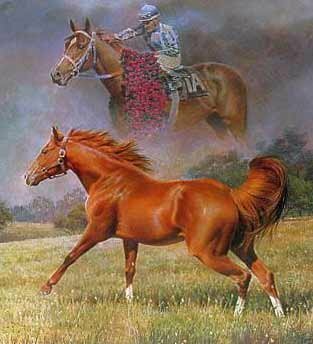 You can even find reproductions of posters from old horse shows and race meetings. To make a simple poster into a great gift, add a fairly plain, elegant frame with glass. You can have it professionally framed, or get a frame at a local arts supply or craft store and do it yourself. Whether you want to include a matte depends on the poster. Some look better with a matte and some are best without one. I've picked out a few here that I really like. There are hundreds more available! Have you ever heard of a buzzer that neighs? Now that is a real attention-getter! Barnyard Answers Buzzers are available from Discount Office Items and, while intended for children, I can think of a few (okay, a lot) of adults who would get a real kick out of these. You can create unique photo books, cards and posters using your own photos on Shutterfly. If you have a child (of any age!) involved in horses, gather a bunch of photos of him or her with horses and ponies and mark their progression as they advance in the sport by putting the pictures into a photo book. That would be a treasure to keep forever, and a special gift they won't get from anyone else. How about a clock? 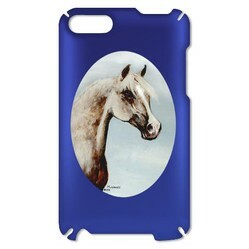 I listed a link previously to CafePress, and clocks are available there with a variety of equine designs. Horse picture frames are great, too. I found one from England that I especially like from A1 Gifts, but a little hunting will find many more. Another English company, Animal Den, has tons of different horse items from horsy socks to throws and pillows to licence plate holders. I also found some really different horse-themed items at Collections Etc., including wind chimes, accent rugs, even a chair cover. I especially liked the buckskin horse throw blanket and wouldn't object in the least if someone gave me one! Buckskin Horse Throw from Collections Etc. Of course, for a girl of any age, you can never go wrong with jewellery, and even the toughest guy may occasionally need to wear cuff links. HorseLoverz (described as the "world's largest on-line tack shop") has lots of wearable art for men and women, including charms, bracelets, earrings, rings, necklaces, pins, hair clips, watches, zipper pulls and, yes, cuff links. The Snaffle Bit Watch (my personal favourite) even comes in a smaller size and three different colours. Finally, don't forget eBay! The list of gift items with a horsey theme is almost endless. You may find something there that is vintage or unique and not available anywhere else. I just spotted a beautiful horse cameo that I would love to own — and a belt buckle — and a Breyer model horse — and a jigsaw puzzle — and a Spanish Riding School postcard — well, you get the idea! Yes there are some lovely horse related gift ideas. Horses are so beautiful anyway that if you know someone loves horses there are good choices as you highlighted. It depends on what you want a horse for. If you just want an ordinary riding horse, any calm, sensible, healthy horse will do. If I was a competitive or experienced rider, I'd go with an Andalusian! They are so beautiful and talented. Someone with a bad back should choose a smooth-gaited breed like a Rocky Mountain Horse. If you want a horse that can do almost anything from tilling the garden to pulling a buggy or sleigh and being a good riding horse, a Canadian, old-style Morgan, Norwegian Fjord or Gypsy Cob would be good. But there are so many excellent breeds out there, it's pretty hard to choose one over another. Every breed has its good points and its own special qualities. I love horses too. I don't know much about them though. Which breeds do you like best, and why?